H2O-generated MOJO and POJO models are intended to be easily embeddable in any Java environment. The only compilation and runtime dependency for a generated model is the h2o-genmodel.jar file produced as the build output of these packages. This file is a library that supports scoring. For POJOs, it contains the base classes from which the POJO is derived from. (You can see “extends GenModel” in a POJO class. The GenModel class is part of this library.) For MOJOs, it also contains the required readers and interpreters. The h2o-genmodel.jar file is required when POJO/MOJO models are deployed to production. Users can refer to the Quick Start topics that follow for more information about generating POJOs and MOJOs. This section describes how to build and implement a MOJO (Model Object, Optimized) to use predictive scoring. Java developers should refer to the Javadoc for more information, including packages. A MOJO (Model Object, Optimized) is an alternative to H2O’s POJO. As with POJOs, H2O allows you to convert models that you build to MOJOs, which can then be deployed for scoring in real time. Note: MOJOs are supported for AutoML, Deep Learning, DRF, GBM, GLM, GLRM, K-Means, Stacked Ensembles, SVM, Word2vec, and XGBoost models. MOJOs are built in much the same way as POJOs. The example code below shows how to start H2O, build a model using either R or Python, and then compile and run the MOJO. This example uses GBM, but any supported algorithm can be used to build a model and run the MOJO. The examples below describe how to start H2O and create a model using R and Python. The download_mojo() function saves the model as a zip file. You can unzip the file to view the options used to build the file along with each tree built in the model. Note that each tree file is saved as a binary file type. Open a terminal window and start R.
Run the following commands to build a simple GBM model. Download the MOJO and the resulting h2o-genmodel.jar file to a new experiment folder. Note that the h2o-genmodel.jar file is a library that supports scoring and contains the required readers and interpreters. This file is required when MOJO models are deployed to production. Be sure to specify the entire path, not just the relative path. Open a terminal window and start python. Run the following commands to build a simple GBM model. The model, along with the h2o-genmodel.jar file will then be downloaded to an experiment folder. Create your main program in the experiment folder by creating a new file called main.java (for example, using “vim main.java”). Include the following contents. Note that this file references the GBM model created above using R.
GBM and DRF return classProbabilities, but not all MOJOs will return a classProbabilities field. Refer to the ModelPrediction definition for each algorithm to find the correct field(s) to access. This is available in the H2O-3 GitHub repo at: https://github.com/h2oai/h2o-3/tree/master/h2o-genmodel/src/main/java/hex/genmodel/easy/prediction. You can also view the hex.genmodel.easy.prediction classes in the Javadoc. Compile in terminal window 2. Run in terminal window 2. The following code snippet shows how to download a MOJO from R and run the PrintMojo tool on the command line to make a .png file. # and run the PrintMojo tool from the command line. What are the benefits of MOJOs vs POJOs? While POJOs continue to be supported, some customers encountered issues with large POJOs not compiling. (Note that POJOs are not supported for source files larger than 1G.) 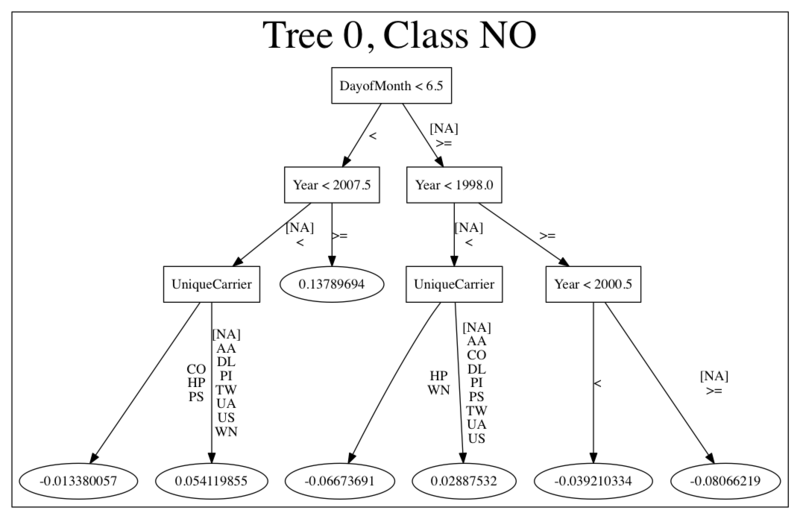 MOJOs do not have a size restriction and address the size issue by taking the tree out of the POJO and using generic tree-walker code to navigate the model. The resulting executable is much smaller and faster than a POJO. At large scale, new models are roughly 20-25 times smaller in disk space, 2-3 times faster during “hot” scoring (after JVM is able to optimize the typical execution paths), and 10-40 times faster in “cold” scoring (when JVM doesn’t know yet know the execution paths) compared to POJOs. The efficiency gains are larger the bigger the size of the model. H2O conducted in-house testing using models with 5000 trees of depth 25. At very small scale (50 trees / 5 depth), POJOs were found to perform ≈10% faster than MOJOs for binomial and regression models, but 50% slower than MOJOs for multinomial models. How can I use an XGBoost MOJO with Maven? This section describes how to build and implement a POJO to use predictive scoring. Java developers should refer to the Javadoc for more information, including packages. Notes: POJOs are not supported for source files larger than 1G. For more information, refer to the FAQ section below. POJOs are also not supported for XGBoost, GLRM, or Stacked Ensembles models. H2O allows you to convert the models you have built to a Plain Old Java Object (POJO), which can then be easily deployed within your Java app and scheduled to run on a specified dataset. POJOs allow users to build a model using H2O and then deploy the model to score in real-time, using the POJO model or a REST API call to a scoring server. The only compilation and runtime dependency for a generated model is the h2o-genmodel.jar file produced as the build output of these packages. This file is a library that supports scoring, and it contains the base classes from which the POJO is derived from. (You can see “extends GenModel” in a pojo class. The GenModel class is part of this library.) The h2o-genmodel.jar file is required when POJO models are deployed to production. The example code below shows how to start H2O, build a model using either R or Python, and then compile and run the POJO. This example uses GBM, but any supported algorithm can be used to build a model and run the POJO. If a confirmation prompt appears asking you to “Load Notebook”, click it. Note: The instructions below assume that the POJO model was downloaded to the “Downloads” folder. Run the POJO in terminal window 2. 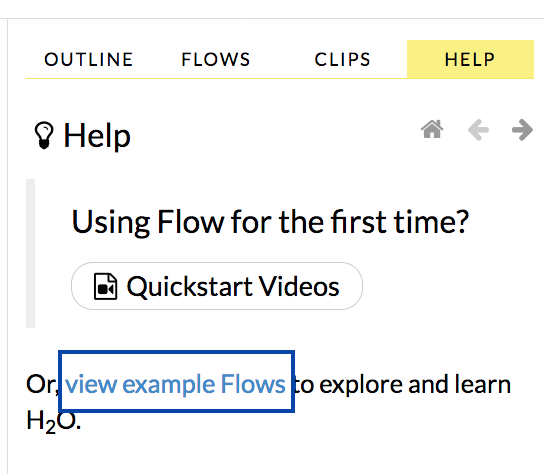 When viewing a model, click the Download POJO button at the top of the model cell, as shown in the example in the Quick start section. You can also preview the POJO inside Flow, but it will only show the first thousand lines or so in the web browser, truncating large models. The following code snippet shows an example of H2O building a model and downloading its corresponding POJO from an R script. The following code snippet shows an example of building a model and downloading its corresponding POJO from a Python script. Reading new data from a CSV file and predicting on it: The PredictCsv class is used by the H2O test harness to make predictions on new data points. Calling a user-defined function directly from hive: See the H2O-3 training github repository. How do I score new cases in real-time in a production environment? If you’re using the UI, click the Preview POJO button for your model. This produces a Java class with methods that you can reference and use in your production app. What kind of technology would I need to use? Anything that runs in a JVM. The POJO is a standalone Java class with no dependencies on H2O. How should I format my data before calling the POJO? Here are our requirements (assuming you are using the “easy” Prediction API for the POJO as described in the Javadoc). How do I run a POJO on a Spark Cluster? The POJO provides just the math logic to do predictions, so you won’t find any Spark (or even H2O) specific code there. If you want to use the POJO to make predictions on a dataset in Spark, create a map to call the POJO for each row and save the result to a new column, row-by-row. How do I communicate with a remote cluster using the REST API? You can dl the POJO using the REST API but when calling the POJO predict function, it’s in the same JVM, not across a REST API. Is it possible to make predictions using my H2O cluster with the REST API? Yes, but this way of making predictions is separate from the POJO. For more information about in-H2O predictions (as opposed to POJO predictions), see the documentation for the H2O REST API endpoint /3/Predictions. Why did I receive the following error when trying to compile the POJO? The following error is generated when the source file is larger than 1G. An exception has occurred in the compiler (1.7.0_60). Please file a bug at the Java Developer Connection (http://java.sun.com/webapps/bugreport)  after checking the Bug Parade for duplicates. Include your program and the following diagnostic in your report. Thank you.